Painting, Sculpture, Architecture in Germany. Two Men Contemplating the Moon. To see how 19th century culture in Germany fits into the chronological development of visual arts in Europe, see: History of Art Timeline. The varied and often contradictory artistic forms of the nineteenth century and the absence of a general continuous artistic development can be understood only by taking into consideration the political and economic events of that period, which completely changed the social and intellectual structure of Europe, as well as the history of art. The French Revolution ended the traditional supremacy of kings and princes, but this gain of freedom meant a loss of inner security. With the end of Absolutism new leaders were needed to give intellectual guidance and take political responsibility. Although the slogan "liberty, equality, fraternity" was understood everywhere in Europe, the general political unrest showed that it was easier to formulate an idea than to carry it out. The revolutionaries had thought that the bourgeoisie would replace the aristocracy as the ruling class, but the transition from subject to self-governing citizen was not an easy one and frequently resulted in a new form of absolute power, exemplified by the rise of the citizen Napoleon to Emperor of France. Even before the French Revolution a change of mood had made itself felt across most fine art disciplines. Towards the middle of the eighteenth century, when social conventions had become governed by a strictly stylized etiquette, representatives of the Sturm und Drang movement vehemently rejected the superficiality of contemporary life. The Age of Enlightenment had relied on the power of the intellect, but this was now being challenged by the 'natural genius'. The stiff, bewigged Rococo cavalier was replaced by the man who wanted to give direct expression to his feelings. This emphasis on the emotions found its ultimate expression in Romanticism, which, particularly in Germany, dominated literature and the fine arts until well into the second half of the nineteenth century. A balance to this unrestrained emotionalism was provided by a simultaneous revival of neoclassical art, championed in Germany by Anton Raphael Mengs and, in France, by Jacques-Louis David. Johann Joachim Winckelmann, who led the first excavations at Pompeii, published his History of Ancient Art in 1763 and thereby helped to initiate the Classical revival. In this work, which was translated into every European language, he compared 'the confusion of forms, the immoderation of expression and the bold fire' of Baroque art with the 'noble simplicity and tranquil greatness of the ancient Greeks', whom, he suggested, were the only models worthy of imitation. He also pointed out the lack of stability and order of the Sturm und Drang in comparison with the balanced harmony of Classical art. Goethe was much influenced by the Classical spirit as is evident from the change of emphasis in his work after his first journey to Italy. The Classical and the Romantic spirits constituted two opposing poles between which the arts fluctuated with searching uncertainty. The reason for this uncertainty was the loss of that solid framework which the monarchical and ecclesiastic hierarchies had provided up to the end of the Rococo. The emerging middle classes, in an attempt to assert themselves, began to take an interest in their national history and in the artistic achievements of the recent past. But while this preoccupation with the ancient Greeks, the Middle Ages and the Renaissance provided a wealth of models, it also created a new dependence and prevented the development of original ideas which could interpret contemporary events and give artistic expression to the spirit of the time. This lack of original ideas partly explains the absence of a general artistic style, but another factor must also be taken into account. After the aristocratic hierarchy had broken down and the Church had ceased to be such a powerful institution, there was no single authority to set a trend and style in the arts by commissioning large works of religious art for churches and other public buildings. The new patrons were individual members of the middle classes, and monumental works of art were therefore replaced by those more suited to the private requirements and limited means of the individual. Architecture therefore gradually lost its prominent position among the fine arts and painting took the leading role. No other period in history is characterized by such architectural poverty as the nineteenth century. As painting became more and more orientated towards private patrons, it lost contact with the broader public and developed in isolation, often in opposition to public opinion. Artists refused to make concessions and the public, not understanding their pictures, refused to buy them. In the past painters had enjoyed general approval and were celebrated and promoted by an art-loving community; now they became outsiders for whom the general public felt at best pity, but mostly only disdain. The underrated artist took his revenge by turning against society, either with sharp criticism or by deliberate aesthetic provocation, with an art for art's sake. Thus an unfortunate gulf developed between artist and society which has continued to widen to this day and has caused countless misunderstandings between the creative artist and the middle-class public. This change was a gradual one, though, and architecture still retained its leading role among the fine arts during the early part of the nineteenth century. Neoclassical architecture replaced the frivolous style of the Rococo and strove towards a new beginning. While the Renaissance had been inspired by ancient Roman works of art, Classicism returned to the original sources of all Classical art and took its models from the ancient Greeks. But a faithful imitation of architectural forms and details could not be regarded as a new style heralding the future and it could not lead to a new beginning; it merely represented a return to the forms of the past. Although Classicism was hailed as a manifestation of middle-class republican opinion, it in fact owed its origins to an elite, no longer the aristocratic elite, but an intellectual elite, the Humanists, the exponents of the Classical revival. Therefore Classicism cannot be regarded as an expression of middle-class ideals; it was at best an aesthetic revolution, a declaration of war on the Rococo. Heavily ornamented facades were out of favour and buildings with clearly defined outlines and smooth, sober wall surfaces were once again preferred. The column was considered the noblest of architectural forms; it was placed in solemn rows along the facades and surmounted by triangular pediments. This design, which is modelled on that of the Classical temple, remained an architectural feature all through the century. Friedrich Weinbrenner's Classicist church at Karlsruhe is enriched by a portico that carries a broad entablature which is decorated by garlands and continues around the building, whereas the columns, in the manner of a Greek prostyle, are limited to the facade. No connection whatsoever exists between the actual structure of this very conventional church and its Classical outer appearance; the interior in no way corresponds to the exterior which has been merely 'dressed up' in the manner of a temple and thereby expresses the main preoccupation of the time, that of creating a dignified impression. Classicist structures in Prussia display considerably greater originality. The Brandenburg Gate was built between 1788 and 1791 by Carl Gotthard Langhans (1732-1808) and although it is based on Classical concepts it nevertheless displays a considerable degree of independence. Langhans combined the idea of the Roman triumphal arch with that of a Greek temple, whereby the openings of the broad gate are created by the wide distance between the columns. The structure was designed as a feature of municipal architecture, but compared to the gigantic Arc de Triomphe in Paris it seems modest in dimension and form and aptly demonstrates the frugal spirit of Prussia. One of Berlin's most beautiful Classicist structures is the Humboldtschlosschen in Tegel, which was rebuilt by Karl Friedrich Schinkel (1781-1841) in 1822 for the Prussian minister and philosopher Wilhelm von Humboldt. No purpose had to be fulfilled other than that of building an intimate structure for a private individual. Schinkel therefore was unhampered by official taste and could express his own ideas on the revival of Classical forms. By the agreeable proportions of individual structural units and their harmonious relationship to each other he achieved a restrained monumentality. The horizontal emphasis of the broad central section is balanced by the verticality of the wings and a completely self-contained unit is thereby created, similar in concept to that of ancient Greek civil structures, yet of a very individual outer appearance. The walls are smooth and free of ornament, only fine, flat mouldings and pilasters produce a meaningful articulation. This small palace combines grace with utility, dignity with modesty, and a knowledge of Classical forms with new free-thinking attitudes. Thus as early as the first quarter of the nineteenth century, Schinkel rejected the restrictions of historicism and adapted Classical forms to meet individual requirements. Schinkel recognized the increasing importance of technology and economics. On his travels he studied constructions made of iron and glass in Paris and admired the growing industry and its 'thousands of smoking obelisks' in England. As early as 1827 he designed a department store for Berlin and stressed its functional aspect by big windows and narrow undecorated strips of wall. This design which was never carried out heralds our modern industrial structures of steel and concrete, whose beauty lies in their functional utility and not in extraneous ornamentation. But the time was not yet ripe for such revolutionary ideas. It took nearly another century before architecture shook off the shackles of misinterpreted traditions and created its own modern style; until then it remained subject to historicism, and that period counts among the darkest chapters of German architecture. The Classicists, in turning to ancient Greece, had tried to discover the origins of European culture. But pure Classicism was of comparatively short duration; by becoming the official style of Napoleon's time it had been compromised, so to speak, as an expression of imperial power. With Napoleon's defeat during the Wars of Liberation (1813-1815), national consciousness awoke everywhere in Europe, particularly amongst German speaking people; this led to a widespread interest in their own past, which was taken up by the Romantics, whose efforts were directed towards a revival of the medieval spirit. The young Goethe had been one of the first to express these sentiments when, in 1771, he wrote his famous essay, On German Architecture, which contained a hymn-like praise of the Strasbourg Cathedral. In the early part of the nineteenth century the enthusiasm for Gothic architecture was as widespread as the enthusiasm for neoclassical Greek architecture that Winckelmann had initiated. Even the Classicist architect Schinkel was influenced by this medieval revival and dreamt of a Gothic national cathedral. He submitted two designs for the Werdersche Kirche in Berlin, one in Gothic style and one in Classicist style, using the same basic structure. This juxtaposition of different designs was characteristic for the nineteenth century, when leading architects were expected to master every style. The South German architect Friedrich Gartner designed three dominating structures with completely different facades for the Ludwigstrasse in Munich: the Siegestor resembles a Roman triumphal arch, the Feldherrenhalle is based on the Early Renaissance Loggia dei Lanzi in Florence, and the university is built in strictly Romanesque style. Only a few years before, Leo von Klenze had modelled the Classicist Glyptothek in Munich on a temple of the muses. One aspect of historicism was the concept that the facade should express the purpose of the structure and this type of architecture was therefore called architecture parlante. The temple facade of the Glyptotek indicates that it houses masterpieces of Greek sculpture; the Befreiungshalle near Kelheim on the Danube, built by Klenze, suggests the victorious fight against Napoleon; and the earnest dignity of a university was, in the opinion of the time, best expressed by the Romanesque style. In fact, however, the interior of these buildings in no way corresponds to their exterior and the insincerity of this architecture parlante thereby becomes obvious. The facade is merely a sign announcing the purpose of the building rather than the expression of an actual governing spatial concept. The famous architect Gottfried Semper built the Dresden Opera in 1837-1841. In this impressive building he reworked traditional elements into an individual composition. Semper, who had studied the humanities before turning to architecture, was also a theoretician of the highest order. He had a profound influence on the development of architecture in Germany. He accurately described the contemporary architectectural scene: "The young architect travels through the world, fills his sketchbook by copying all kinds of things and then happily returns, confident that a commission for a Valhalla a la Parthenon, a basilica a la Monreale, a boudoir a la Pompeii, a palace a la Pitti for a Byzantine church, or even for a bazaar in the Turkish style won't fail to turn up. These commissions did not, in fact, fail to turn up, but after 1850 the stylistic confusion increased. The architecture parlante had at least retained a thematic connection between the facade and the purpose of the building, but complete arbitrariness reigned during the second half of the nineteenth century. Theatres, railway stations, post offices, factories, even prisons were built in Romanesque, Renaissance or Baroque style, and the facades of big apartment houses became the scene of an unrestrained imitative drive, while behind these houses dark airless yards bred misery and despair. The engineering constructions of the early twentieth century gave the first indication of a modern objectivity which, however, was not generally accepted. The following edict was issued in the year 1912: "New churches are to be built in Romanesque or Gothic style or in the so called transitional style. For our area Gothic art is considered most suitable. In recent years some architects seemed to favour later styles or completely modern designs. In future no building permission will be granted for these except under very special circumstances." This regulation may seem incomprehensible today, but the city of Cologne, where this edict was issued, must be forgiven because there historicism did achieve a positive result: the completion of the cathedral which had remained unfinished for three hundred years. Upon the discovery of the original plans the missing section between the chancel and the western Facade was erected with great technical skill and remarkable sensitivity and the towers were brought to their full height. No other epoch before or after would have had the incredible patience or born the immense expense of such an impressive accomplishment. At a time when the arts were dominated by a Classical revival, sculpture, which had been the most important medium of artistic expression for the ancient Greeks, naturally gained in importance. On his travels, the Classically orientated artist filled his sketchbooks with drawings of ancient Greek and Roman statues and the art lover, in the absence of originals, decorated his house with plaster copies. Wilhelm von Humboldt's impressive collection of plaster casts can still be admired in Tegel. At that time a state-owned company for the manufacture of neoclassical sculpture in the form of plaster casts, was founded in Berlin which to this day supplies half the world with copies of sculptures and reliefs from every artistic period. The desire to imitate found a legitimate outlet in the plaster cast which was purely reproductive, but imitation produced less fortunate results when formulated in creative sculptural terms. Many neoclassical sculptors chose models of Italian origin, which were mostly inferior copies of Greek originals, with the result that imitation was being imitated. Furthermore the Classicists completely misunderstood the meaning of ancient Greek and Roman statues by blindly accepting Winckelmann's view that the ideal beauty of Classical sculptures was the expression of a superior and noble spirit. They saw the 'Apollinic' in Greek art, but they overlooked the 'Dionysiac' and failed to recognize that ideal beauty can only be attained by experiencing the passions, conflicts and torments of human existence. Consequently they strove for an aesthetic perfection through the balanced proportions, the appealing smoothness and the noble harmony of Classical sculptures. The Italian Antonio Canova and the Dane Bertel Thorwaldsen were among these idealists, whereas the Berlin sculptor Gottfried Schadow openly attacked this blind veneration of Classical culture: "There is no abstraction and there should be none, either in nature or in art. Beautiful, ideal humanity does not exist, only exquisitely beautiful human beings." His keen sense of reality is strongly expressed in a number of highly individualistic portrait sculptures such as those of the Princesses Luise and Friederike. Only the girls' dress is Classical and slightly idealized. Their natural affectionate embrace is seen in purely human terms and absolutely true to life; it joins them like real sisters, intimate but not overly interested in each other, each following her own thoughts, inseparable only because familiar habits unite them. Each is a personality in her own right: Luise anticipating the future burdens of her royal office, Friederike more carefree, private, childish. Schadow's pupil Christian Rauch succumbed to the pressures of an important commission and abandoned his teacher's realism in favour of a more pleasing idealization. Among his best works are a number of portraits on monuments and mausoleums. The equestrian statue of Frederick the Great in Berlin presents the Prussian king in the pose of a great military leader; only the facial expression shows the monarch as a philosopher and representative of the Age of Enlightenment. Schadow at the end of his life ironically commented on the increasing intellectual shallowness of contemporary sculpture which was expressed by the charm, smoothness and pathos of his pupil's work. The middle classes, however, found these sculptures pleasing and soon parks, gardens, public squares and fountains abounded with such monuments. Franz Xaver Messerschmidt, the German-Austrian sculptor best known for his extraordinary "Character Heads", was an early Neoclassicist, but properly belongs to the 18th century. The Classicist style found little following among German painters, but the work of contemporary French artists, consisting mostly of historical tableaux, shows how unsuited these intellectual and literary concepts were for painting. The humanistic and liberal ideals of German neoclassical artists found expression in such famous works of German literature as Goethe's Tasso and Iphigenie, but there was no corresponding expression in the pictorial arts. Painters of that time portrayed warm-hearted human scenes without achieving anything universally valid. In short, neoclassical painting failed to inspire German painters, and what eventually led to a break with the past was a new interpretation of nature. During the Rococo, stylized landscapes were used as an elysian stage for pastoral idylls and romances. This artificial view of nature was decisively rejected by Ferdinand von Kobell, who was born in 1740. Although he, at first, was a follower of the Netherlandish and Italian landscape painters, he later disassociated himself from them and, regardless of current fashions, developed his own interpretation of nature. From about 1780 he no longer painted imaginary scenes but portrayed actual events. His clear, wide landscapes are free of affectation and pathos and avoid the sentimentalism which predominated later during the Romantic. Wilhelm von Kobell enriched the realistic portrayal of landscape, which his father had perfected, with a subjective expression of atmosphere, but he too attempted to describe nature objectively. In his Siege of Kosel the combination of Classicist figures and a Romantic presentation of nature produces a very charming effect. Unlike German Baroque artists, who used diagonal lines to heighten the spatial dynamic, Kobell built his landscape on a system of verticals and horizontals and thereby attained that harmonious balance which was a main concern of Classicist art. The representation nevertheless conveys a very natural, lively atmosphere which is achieved by the masterful introduction of light; a low sun produces a pleasing interplay of light and shade on the promontory in the foreground. Officers and soldiers look into the wintry sun and at the town of Kosel before them, seemingly admiring the softly illuminated landscape that stretches into the hazy distance. A less war-like picture of a siege has rarely been painted. Joseph Anton Koch (1768-1839) was a highly accomplished master of landscape painting who combined keen observation with great sensitivity. He wrote: 'Art is more than mere imitation. Even when art appears natural it should transform nature by formulating it stylistically.' Motivated by the desire for absolute validity he presented neither an objective description nor a poetic atmospheric image, but a subjective symbolic interpretation which portrayed nature's perpetual renewal, regularity and simplicity. Even in his drawing and watercolour painting Koch expresses this characteristic attitude and formulates what he has seen in strongly individualistic terms. In his study Schmadribachfall he refuses to exploit the possibilities of the medium; instead of working with a wet brush to obtain the picturesque intermingling of tones and the transparent effect of watercolours, he applies them heavily, like oils, and completely covers the paper. The white snowy mountain tops and the white foam of the waterfall are not the white paper showing through, but a heavy layer of white paint. The solid forms thereby achieved and the landscape's vertical structure give the picture an impressive monumentality. Koch's influence on the next generation of German landscape painters was considerable. Among his admirers were Preller, Fohr, Overbeck, Richter and Carl Rottmann. The latter he met in Rome, where many of Germany's leading artists congregated at the time. Rottmann was attached to the court of Ludwig I, king of Bavaria, who had commissioned a picture of Palermo and who later sent Rottmann to Greece in search of suitable motifs for a fresco cycle which was to decorate the Royal Garden Arcades in Munich. During this journey Rottmann made a watercolour drawing of the island of Santorini, which had appeared out of the sea during a volcanic eruption in 1540 BCE. This titanic aspect of nature constitutes the theme of Rottmann's study; the rising smoke is a symbol of the eruptive forces that once created the island. Bizarre naked rocks, magically illuminated by a thundery light, stand in front of a dark bank of clouds which throws deep shadows onto the water. The bleakness of the island is accentuated by the minute size of the village perched on the rock, and the harshness of the landscape is matched by the nearly tectonic structure of the picture which leaves no room for a poetic mood. Even the reflections on the water are made rigid by the horizontal structure of the surface, and the predominantly cool tones underline the heroic mood that lies over this bay. A picture which most superbly expresses the concepts of this age is the portrait Goethe in the Campagna by Johann Heinrich Wilhelm Tischbein (1751-1829). The painting represents the mature poet, ennobled by his journey to Italy where he encountered the Classical past. Goethe is shown in the pose of a Humanist, a citizen of the world, against an Arcadian background, which symbolizes his longing for Greece. It was this portrait of Goethe, one of the most eminent figures of German literature, which made Tischbein famous; the rest of his work would only barely have earned him credit as a talented portrait painter. Tischbein had the good fortune of meeting Goethe in Italy and they soon established a close friendship. In January 1787, three months after his arrival in Rome, Goethe wrote enthusiastically: "The strongest attraction that Italy holds for me is Tischbein." And a few weeks earlier Tischbein had noted: "I have started a portrait; I shall make it life-size and show him sitting on the ruins, lost in thought, reflecting on the destiny of man." Tischbein started the portrait without Goethe's knowledge but subsequently obtained the poet's expressed approval. The wide white travelling cloak evokes the Roman toga, the broad-rimmed hat effectively surrounds the face with dark shadows and, as Tischbein had intended, the poet's expression conveys a reflective mood. Goethe himself never saw the finished picture; he left Rome before its completion and the portrait remained in Naples until 1887, when it was brought to the Staedelsches Kunstinstitut in Frankfurt. While the Classicists strove for order and regularity, which they hoped to achieve through clarifying reason, the Romantics took a subjective view of life and advocated simple piety and a return to the emotions. Romanticism cannot, however, be regarded as a reaction to Classicism. The Classicists' preoccupation with ancient Greece and Rome was no less sentimental and fanatical than the Romantics' enthusiasm for nature and their rediscovery of German medieval art. Tischbein's portrait evokes Classical themes but the sentiments expressed are those of a Romantic; it does not show the poet's relationship to the past but instead expresses pictorially the unresolved ideas regarding the origins of poetic inspiration. The Romantics viewed God, man, nature and culture as a single experience, communicated through the emotions, and regarded the world as a poetic harmony in which contradictions and contrasts, the conscious and the unconscious, merged and complemented each other. This subjective emotional reality was not governed by any rules of religion or society; it was created by the imagination and expressed itself in totally subjective ways. Therefore the Romantics were, at first, unable to find a common theme. They believed in individualism and personal originality, but these attitudes by their very nature could not be adopted by a group and consequently Romantic artists in their self-imposed isolation were often prone to melancholy and sadness. The difference between the ordered view of the Classicists and the purely subjective view of the Romantics can clearly be seen by comparing Kobell's Siege of Kosel with Boating on the Elbe by Carl Gustav Carus. In Kobell's picture the eye can roam freely from the magnificently clad horsemen in the foreground to the town, silhouetted in the middle ground, or to the misty, mountainous background. Carus, on the other hand, uses the structure of the boat to narrow down the picture, and forces the eye to travel in a given direction, at the same time challenging the spectator to identify the two figures from behind. The artist thereby presents a very personal impression and does not hesitate to falsify reality in order to make his theme pictorially explicit. The Elbe is depicted as an almost invincible surface of water behind which the towers and domes of Dresden flash in the midday haze. The girl's posture suggests a longing which is directed towards a dream city, not towards the real Dresden; she is spatially isolated from the viewer as well as from the oarsman, she is removed from reality and freely follows her dreams. Carus presents nature as seen through the eyes of a dreamer, no longer unreflected, no longer without prejudice. The girl, in turn, is revealed through the poetic mood of the painting; she has been assigned the role of mediator between landscape and viewer. Man's dialogue with nature is one of the predominant themes of Romantic paintings. Numerous attempts had been made in the past to include man in the presentation of nature but the connection remained a loose one. Either nature served merely as a pleasing background for figurative scenes, or landscape paintings were enriched by groups of figures in order to enliven the picture through colour and movement and create an impression of spacial depth. The Romantics not only made the human figure an inseparable part of the composition, they went even further and attempted to involve the viewer. In Carus's picture the empty space next to the girl is intended for the viewer, from there he can participate in the experience of nature and peacefully follow his thoughts and dreams. Carus was what one calls today a Sunday painter. He studied medicine at Leipzig and from 1815 practised gynaecology at the surgical academy of Dresden, where he was appointed Royal Physician in 1827. His writings on psychology and other subjects were highly respected not only in medical circles but among representatives of the Romantic movement. Caspar David Friedrich in particular repeatedly quoted Carus's views on aesthetics. 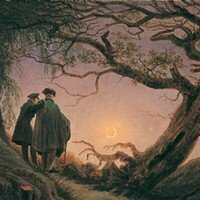 The works of Caspar David Friedrich (1774-1840) represent the Romantic attitude in its purest form. Unlike Carus he showed decidedly melancholic tendencies without, however, indulging in any form of sentimentality. His melancholia stemmed from a deep, simple piety, an insatiable longing for the infinite, and an unfulfilled desire to understand the whole universe, but these yearnings also were his source of inspiration. His paintings always portrayed human beings in contrast with nature, against whose strength and force man is totally powerless. Friedrich saw man as a transient part of creation and nature as infinite and everlasting. In his drawing Winter landscape and figures are thematically fused to convey the meaning of the picture. A setting moon over the sea establishes the basic mood for this melancholy contemplation of the ephemeral aspect of human life and endeavour. The ruins of a church loom behind the little graves and to the right two broken dead trees are symbolically silhouetted against the sky; in the foreground an old couple are digging a grave in the moonlight. The infinity of sea, sky and moon is contrasted by the finite aspects of life on earth. The monochrome tones of this sepia drawing give the scene a universally valid meaning. Less pessimistic, but suffused with romantic poetry, is the painting Chalk Cliffs on Rugen, which illustrates Friedrich's abilities as a landscape painter. His description of nature shows that his eyes and heart have remained open to the wonders of creation. From a clearing on high cliffs three wanderers admire the view of the sea far below. In the foreground every leaf and blade of grass is depicted in minute detail and the hard, sharp outlines of the chalky rocks are drawn with great precision; only the soft and unformed surface of water in the background fades gently into the distance and fuses with the misty sky at the horizon. By placing two small sailboats on this infinite stretch of water, Friedrich expresses his longing for the unreachable; they symbolize man's insignificance in the face of nature. Despite their personal, emotive language Friedrich's descriptions of nature found an immediate response, whereas the heavy symbolism of the North German Romantic painter Philipp Otto Runge had a very limited appeal. 'It is a vain hope', he wrote resignedly, 'that the public might understand us. Individual relationships alone are possible, they are indeed what sustain us.' Therefore his pictures convey most strongly the Romantics' self-isolation; they express in a deeply tragic mood the loneliness of man in a world threatened by dark forces. The large painting of his parents, his eighteen-month-old son and his three-year-old nephew is anything but a touching family idyll. The deep seriousness of the old couple seems to affect the children whose faces are reserved, almost sad and tired, and the pathos of the scene is increased by the addition of a lily and a thistle, symbols of innocence and of the difficulties which these children will have to face in life. Even a view of the open landscape does not add gaiety to the picture; dark clouds in the evening sky bode little good for the coming day. But it nevertheless remains a moving picture, which expresses the love and respect of a son for his parents. There is no bitterness in these faces marked by a hard life. The erect figures reveal the dignity and pride of human beings who, even in their old age, are strong and indomitable. Their Sunday clothes accentuate the nobility of their appearance and are an outward sign of their inner attitude. The calm natural way in which the woman leans on the arm of the man conveys the warm intimacy of this couple who have gone through life together and to whom the happiness of a joint old age has been granted. The high ideals of the Romantic were soon discarded. Their world-embracing emotions were replaced by a more personalized, intimate happiness, and the large-scale view of nature was transformed into a contemplative idyll. The past, the world of fairy-tales and pious legends, provided an escape from the miseries of the present and artists were inspired by sweet dreams of fairies, dwarfs, saints and princes. These attitudes were expressed by Ludwig Richter and Moritz von Schwind, whose works presented a happy, peaceful picture of life. Schwind's real achievement, however, was not the charming genre pictures but his illustrations of fairy- tales; his importance equals that of the Grimm Brothers as far as the revival and preservation of German fairy-tales are concerned. Carl Spitzweg's pictures describe the quiet happiness that flowers in seclusion, far from the problems of this world. The romantically idealized past did not inspire him, he was only interested in his contemporaries, particularly members of the middle classes, the people after whom the period 1815-1850 was later called Biedermeier. Carl Spitzweg (1808-85) described this world with inimitable charm, not as a critic, or by satirizing it, but as a smiling observer. He showed affection, coupled with poetic irony, for odd, quaint, and even scurrilous characters whom he discovered in remote corners of the city, in backyards, and in the narrow rooms of old houses. The titles of his pictures, The Cactus Lover, The Poor Poet, The Love Letter, The Lover of Books, might just as well be titles of short stories. In The Stage-Coach Spitzweg depicts an episode in the life of the inhabitants of a remote, narrow alpine valley. Full of curiosity, they have assembled to watch the heavily loaded, rocking coach climb the steep path; they readily lend a hand to assist the poor horse which does not seem to be able to manage on its own. It provides them with a few moments of gay distraction and an opportunity to come into direct contact with this emissary from the outside world. But soon the coach will disappear behind the next bend of the road and the valley will once again return to the deep quiet peace which, even in the midst of all this commotion, lingers over the steep rocks. The strong emotional content of the picture is conveyed not only by the contrast between the small figures and the powerful scenery, but also by the extremely subtle oil painting technique. The use of diffused cool tones accentuates the majestic size of the background while the warm, glowing colour pigments of the foreground create a vivid impression of bubbling movement and lively intimacy. The dazzling light of a friendly summer's day which illuminates the scene, gives a soft glow to the mountain slopes and produces amusing reflections in the foreground. Earlier Romantics portrayed the meeting of man and nature in a melancholy fashion, but not Spitzweg, whose paintings create an atmosphere of happy harmony. Another prominent artist of the mid-nineteenth century was Alfred Rethel, who received his early training under Wilhelm von Schadow at the Dusseldorf Academy. Skilled as a draughtsman as well as a painter, his series of woodcuts of the Dance of Death is considered his masterpiece. For Spitzweg's closest contemporary in Austria, see the Biedermeier expert Ferdinand Georg Waldmuller (1793-1865). Towards the middle of the century the Biedermeier style of art, with its peaceful life of small pleasures enjoyed in the comfort and privacy of the home, was disrupted by political events. The Revolution of 1848 in France had its repercussions in Germany and, after decades of political passivity, a wave of unrest swept across the country which unmistakably announced the beginning of the industrial age. The aims of these new revolutionary movements were considerably more realistic and tangible than those of 1789 had been. Instead of liberty, equality and fraternity, the people now demanded freedom of the press, freedom of assembly, the introduction of universal franchise, and the protection of the rights and interests of the workers, that new social class which had emerged as a result of the industrial revolution. The idealism of the early nineteenth century, which had turned to the past in an attempt to find new standards, was replaced by a new realism, and this soon became the accepted theme for literature and the fine arts. With the invention of photography by Daguerre in 1839, the artist's eyes were opened to the value of objective reality, which up to now had been rejected as trivial and therefore not worthy of representation. Aesthetic and historic ideals were rejected and, not wishing to replace these merely by a new set of ideals, realist artists attempted to keep their paintings free of any ideology and to represent only what actually existed. Realism first started in France - pioneered by the graphic artist Honore Daumier, the plein-air painter Jean-Francois Millet, and others - and was immediately accepted there, whereas in Germany a great deal of importance continued to be attached to a picture's narrative and idealistic content. Adolph Menzel (1815-1905) never had a public show of his realistic pictures during his lifetime, and a critic's comment on Karl Blechen's paintings was 'they hit you in the eye'. The artists themselves were undecided. Part of Menzel's work belonged to the new Realism, the rest remained completely under the influence of the Bledermeier. His illustrations to Kugler's History of Frederick the Great are Rococo-like historical pictures which despite their exceptionally high artistic merit belong to the past. Karl Blechen also oscillated between Romantic and Realism. Many of his landscape paintings are pure descriptions of atmosphere but he also painted Rolling-Mill near Eberswalde, which shows all the ugliness of a landscape dominated by smoking chimneys, and he thereby created the first industrial painting. But while Blechen only described the outside of a factory, Menzel, a little later, went right inside this new industrial world, and in his picture The Rolling-Mill, described the dirty, unhealthy atmosphere of a factory and the workers' heavy labour. This down to earth representational art was not intended as social criticism, Menzel wanted neither to warn nor to create heroes, he merely wanted, as a painter, to state the facts as they were. This objective way of seeing things, like a reporter, reveals Menzel as a true Realist, who denies himself any intellectual interpretation of his subject in order to preserve its reality. Nevertheless, Realism never became an end in itself for Menzel, who always remained highly individualistic; without falsifying reality he submitted it to a process of abstraction by eliminating trivialities and stressing its purely pictorial aspects. In his picture Interior with the Artist's Sister Menzel devoted all his attention to light and the many effects it creates. The lamp in the background throws a bright circle of light on table and ceiling while its frosted glass shade provides evenly diffused light for the rest of the room. In the foreground a candle illuminates the sister's face from below and produces golden reflexes on the door frame. The quiet, nearly Biedermeier mood of the scene is contrasted by the moving play of light and shadow in which the details of figures and objects become less recognizable. With generous open brush-strokes the artist unhesitatingly sums up the trivial and lingers lovingly on the round, soft face of the girl who looks dreamily out of the picture. The great attraction of his painting lies in the ephemeral quality of the scene: the distribution of light and shade as well as the girl's position, half in, half out of the door, exist for just that moment; the artist underlines this fleeting aspect through a nearly impressionistic technique. If Menzel is described as a master of Realist painting then this is the result of a need for classification, which does not do justice to his personality and versatility. The South-German Wilhelm Leibl (1844-1900), on the other hand, was a true Realist. 'Man should be painted as he is, the soul is included anyway.' This pronouncement of Leibl's is a clear rejection of the painting of ideas but also of the painting of atmosphere, which Menzel continued to practise. Leibl painted what he saw, avoiding any intellectual or artistic revaluation of reality. On the contrary, he absorbed it with photographic objectivity and reproduced it faithfully, detail after detail, thereby transforming reality into good, competent painting. Leibl's famous picture Three Women in Church constitutes the epitome of German Realism. Any attempt at an anecdotal or allegorical interpretation such as 'three phases of life' is inappropriate in view of Leibl's exact rendering of realistic details. He lavishes the same attention on every grain of wood, each fold of the dresses, every characteristic of the cloth, as on the faces and hands of the women. This complete equality in the treatment of figures and objects is an entirely new attitude of reality. For Leibl reality was a complex unit, in itself worthy of portrayal and therefore able to exist on its own without narrative or idealistic content. In view of the perfection of photography, Realism, as Leibl understood it, seems superfluous to us, and the recent experience of Blut und Boden art makes his simple peasant figures seem slightly suspect. But it must be remembered that Leibl made the first brave attempt to free painting from its dependence on philosophy, literature and history. In his pictures objects and figures are purely representational and their impact is produced by artistic means alone. By abandoning narrative painting and adopting a purely representational form, he broke away from a pictorial tradition to which European painting had been committed since its earliest beginnings. The final break, however, was only to occur in our century, when not only the action but also the realistic object was eliminated from the picture. Also see the eminent portrait artist Franz von Lenbach (1836-1904) who was the most successful and best paid portraitist in the German Empire of the 19th century. Hans Thoma (1839-1924) belonged to Leibl's circle for a period and created some outstanding landscapes whose conscientious naturalism ranks them among his best Realist paintings. His scenes of the Taunus and the Black Forest present a faithful and objective description of nature, but at the same time the artist permeates the visible reality with strong feelings and his pictures express an almost romantic enthusiasm. In his Landscape in the Taunus the clarity of the atmosphere and the summer light are enchanting and reveal the topographical features in every detail, while the figure of the wanderer adds a subjective note to this realistic portrait of nature. Seen from the back the figure not only serves to increase the depth of the picture but also provides an emotional link between the viewer and the landscape. Contrary to Leibl, who wanted to reproduce reality unreflected, Thoma's intention was to paint not the outer appearance but 'the inner picture, that develops during the active process of seeing, which we call fantasy or imagination'. 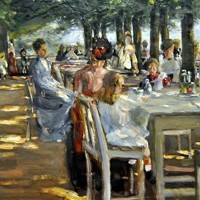 In Liebermann's painting Papageienallee, the bright summer light which flows through the leafy dome of the avenue diminishes the plasticity of the figures, although their outlines remain clear and distinct. Even the colours retain their value, although the thick foliage acts as a green filter and tints the neutral light of the sun. Renoir would have used the green light to produce those green reflections on the white dresses which his contemporaries ironically referred to as 'mildew'. Liebermann, however, gives these bright shadows a yellowish lilac colour which provides a pictorial contrast to the luminous green of the lawn and the trees. Although Liebermann's painting technique and 19th-century colour palette were Impressionist, he developed his own way of using colour and light for the pictorial rendering of visual concepts. 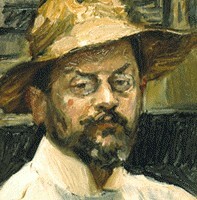 Similarly Max Slevogt adopted the techniques perfected by the French Impressionists in order to express his own ideas. He too had been influenced during his early years by the great Realist painter Leibl without, however, achieving the same intensity. Slevogt's further progress was decisively affected by a two-year stay in Paris as well as by a long journey to Italy. During this time he developed a preference for bright, luminous colours as well as a spontaneous, flowing brush-stroke which enabled him to transform whatever he portrayed into a purely optically meaningful experience. According to his motto 'the eye sees what it looks for' he frequently chose optically sensational themes: exotic animals, plants and fruits, but mainly the glittering world of the theatre. Its colourful atmosphere, its magic of beautiful illusions that become reality on the stage, corresponded to Slevogt's own artistic inclinations. He shared his love for the theatre with the French Impressionist Degas, but while the latter was concerned with the rules governing the dramatic arts and portrayed their more formalized aspects, Slevogt was inspired by the unrestrained fantasy of the theatrical world and its unlimited possibilities of expression. Therefore he was mainly interested in the stars, the actors, the dancers and singers, whose personal friendship he sought and whose stage triumphs he described in many pictures. Among the most famous are those of the Portuguese singer d'Andrade which show the great tenor in his role as Don Juan: The Champagne Song, The Duel and The Graveyard Scene. These Impressionist paintings are neither portraits nor documents of theatrical history, but merely describe in pictorial terms a musical and theatrical event. They lack emotional depth as a result, and in no way express an ideal; they are unproblematic, gay, full of light and colour, portraying only beauty. The culture-conscious public of the late nineteenth century vehemently rejected Realism and the idea of art for art's sake. Leibl and Thoma recognized this when their pictures were refused by important official art exhibitions. Slevogt and Liebermann did not fare any better. In protest against the dictating of taste by the Paris Salon, Liebermann founded the Berlin Secession in 1898, which soon attracted all the progressive young artists. The Munich Secession, meanwhile, was popularizing Jugendstil - the German variant of Art Nouveau. (See also the Vienna Secession, under Gustav Klimt, and the later Deutscher Werkbund.) But criticism of Realist and Impressionist painting was voiced not only by the middle-class art lover, it also came from those artists who saw the only possibility for a renewal of painting in the return to old ideals. 'I fear the unimaginativeness and emptiness which now rule the world; we must return to the old gods. It is not possible to turn to the future, for what future can be in store for the men of money and machines?' This remark by Anselm Feuerbach reveals disappointment and resignation. Recent political developments had brought about the long desired unification of Germany but they had also produced a society intent on expediency and gain. For more about German painting at the end of the century, see: Post-Impressionism in Germany (c.1880-1910). Feuerbach found this timeless ideal human image in the person of the Roman Nanna Risi, the wife of a poor cobbler. She became his favourite model, also his mistress. Feuerbach painted her as a simple working-class woman, as Iphigenie, as Lucretia, as Bianca Capelli; she was for him the embodiment of the Classical ideal that he wanted to realize in his art. However, Nanna the woman did not live up to her majestic noble exterior; after five years with Feuerbach she left him for a more solvent lover. Another simple Italian girl, Lucia Brunacci, modelled for the second version of Iphigenie. In spite of her monumentality, which nearly fills the picture, this Iphigenie is by no means a statue without a soul. She is a woman full of dreams and longings for an unattainable world, her features are expressive, she is a human being, and yet she represents a perfect personification of Goethe's Iphigenie. Feuerbach achieved these effects by his subdued colours, by the relief-like plasticity of the folds of her dress, by the narrow format of the picture which dictates the figure's passivity. She seems to explain herself to the viewer through her proximity, but at the same time she withdraws from him again, remains isolated, follows her own thoughts. Thus she represents an ideal, the inherent and insatiable longing of man for perfection and harmony. This strange and fascinating combination of Romantic and Classicist concepts was for the time being the last flickering of a highly strung idealistic attitude in the pictorial arts. The Germans-in-Rome exercised no influence on future developments because they failed to come to terms with the realities of their time. German painting was also affected by 19th century Russian painting - notably the naturalism of its landscape painters - and by the literary Romanticism of the Pre-Raphaelite Brotherhood in England. Works by 19th-Century German artists can be seen in many of the best art museums in the world. In particular see the collections in the Gemaldegalerie SMPK Berlin, the Gemaldegalerie Alte Meister Dresden, the Wallraf-Richartz-Museum in Cologne, the Pinakothek Museum in Munich and the Kunsthistorisches Museum in Vienna. We gratefully acknowledge the use of material from Deutsche Kunst (German Art) - published by Georg Westermann Verlag, Brunswick, Germany, and translated by Pall Mall Press Ltd - a publication we strongly recommend for any serious students of 19th century art in Germany.  For the greatest painters and sculptors, see: Best Artists of All Time.  For more about 19th century German painting and sculpture, see: Homepage.